I was initially a bit hesitant to read this. I had read her most recent novel, Big Little Lies, a few months before and, while I enjoyed it, I felt that it was a bit on the satirical side. That is fine now and then, but I had the feeling--unfairly--that this tone would show up again in Moriarty's other novels. 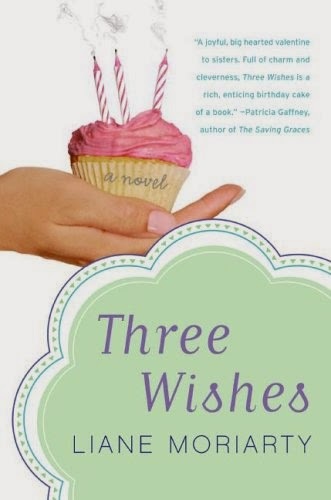 But, then came the day I needed something light to read on my phone (I'm hiding my face in shame as a I type that....) and, scrolling through the many, many kindle titles I own, I settled on Three Wishes. The strongest aspect about the book is how well Moriarty crafts here characters. At the center of the story, of course, are the triplets. Each woman has a very distinct personality, and Moriarty doesn't base their characters solely on the fact that they are triplets (I've read a number of books with twins as characters where this was the case). Yes, there is some element of their birth in their personalities, especially in Gemma's character. Lyn and Cat are identical and Gemma is not, which would, of course, have some impact on her. For the most part, however, the women are shaped by what they experienced in their back story and will experience as the plot of this book. Even the secondary characters--the women's parents, their assorted partners, and their grandmother-come to life and, with the exception of the Grandmother, are able to buck any cliches (and, even though she is a bit stereotypical, Nana Kettle is still a treat). Moriarty deftly structures this novel so that you are sucked in at the opening scene and you spend the next 3/4 of the novel getting back to that point. It doesn't read as a flashback--instead, it is almost like looking at scene through a window and then walking through a door into the scene itself. I was afraid that the last 1/4 of the would be a letdown. Once the reader swoops back to the original scene, where can they go? While Moriarty does use this part of the book to wrap up the rest of the story, it doesn't fell like a throw-away. She takes the time to draw each character's arc to a satisfying conclusion. There is only one point that keeps me from giving this a 5 star review. Two of the sisters are or were involved in adulterous situations, but on different ends. Moriarty makes a few comments about this, enough to make the reader think that this should be a point of contention between the two characters, but then she drops it without offering any closure. I think Moriarty missed a great opportunity to delve even deeper with these two sisters. In the end, though, this was a delightful read and one that convinced me that Liane Moriarty is more than Big Little Lies. This is a book that I would recommend to just about anyone looking for sometime fun and light--but not fluffy--to read.